From Monday, 5 October, shoppers in England will be charged 5 pence for single-use plastic bags, as part of a government effort to reduce litter and protect wildlife. The charge will be applied in large shops and supermarkets with 250 or more employees. The government reportedly expects the charge to reduce the use of plastic bags in supermarkets by up to 80% and up to 50% in high street shops. It also expects to save £60 million in litter clean-up costs. So don’t forget to bring your BRAG bag (and other reusable bags, of course) when you’re out shopping! You’ll save money while helping safeguard the environment. A yellow monster truck pushes mounds of rubbish across the summit of Britain’s biggest waste mountain. The 50-tonne beast has huge, spiked, steel wheels that grind mattresses, plastic bottles, trainers and traffic cones into the mud of the manmade peak. This strange landscape is Packington landfill, near Birmingham. And this week Sita UK, which owns and operates the site, closed its gates for the final time. A boom in recycling, coupled with the 1996 landfill tax have slowly choked the life out of the refuse disposal sector. The charge of £80 a tonne will rise again to £82.60 from April, forcing the industry to deal with its waste in different ways. The 28 EU member states will be required to reduce the use of single-use plastic bags by 80% by 2025 under new rules agreed by the European Union this week. Countries can decide themselves how to achieve the goal, through measures such as charges for plastic bags or outright bans. There is already a 5p charge for single-use bags in Scotland, Wales and Northern Ireland, and England will follow suit in October, with the money collected to be used for environmental and charitable causes. Økologiske Råd (Eco Council) in Denmark has launched a mobile app that lets users know where they can get their electronic products repaired, even if the product was bought in another shop and the warranty period has expired. The idea is to inspire people to repair their electronics instead of throwing them out. The app has been developed as part of a project to promote the repair of electronic equipment, thus reducing the amount of waste. Would you like a quick and easy way to reduce the amount of waste in your bin? Then sign up to the Rubbish Diet and get tips and support from a whole online community of Rubbish Dieters. Within a month, you should be enjoying a lighter bin and less hassle – and you might even make some savings. The Rubbish Diet has the broader aim of shrinking the waste train that leaves London six days a week. It is made up of 26 carriages holding 78 containers of household waste from just six London boroughs: Brent, Ealing, Harrow, Hillingdon, Hounslow and Richmond. The train’s contents go straight to landfill here in the UK. It’s reckoned that about 67% of its contents could have been recycled first. The Rubbish Diet is a simple two-step programme: First, you’re asked to check whether you can recycle one more thing and to share your own ideas for avoiding waste. The second step is about making the most of your food. The programme is tailored to your area and comes in the form of handy emails with tips, links and information about how to get started. Most participants reduce their waste by up to 70%. 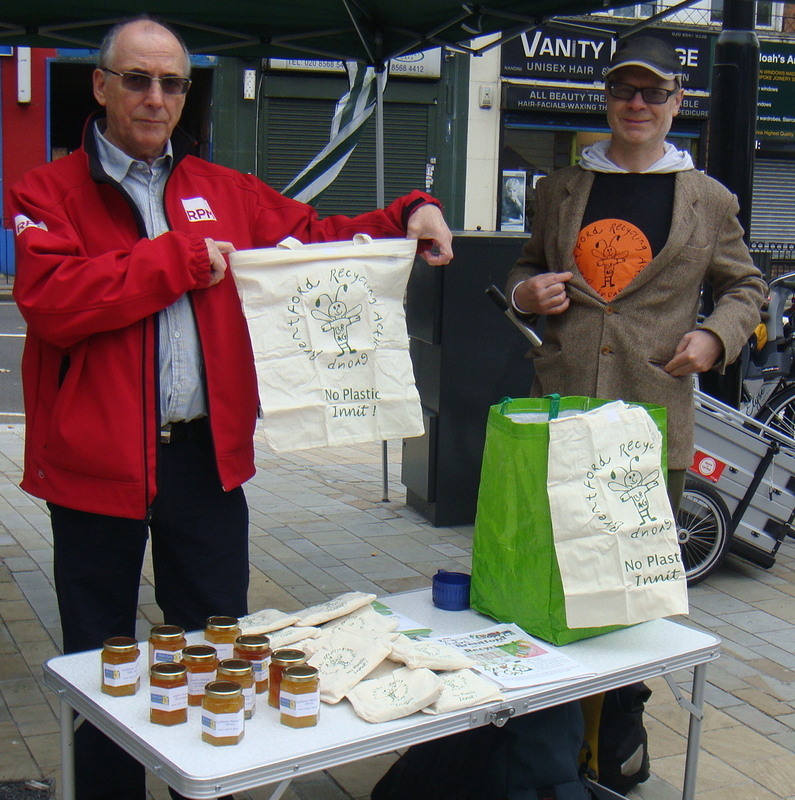 Sign up for the Rubbish Diet at http://challenge.therubbishdiet.org.uk/; further information is available at http://www.therubbishdiet.org.uk/wastetrain/ and https://www.facebook.com/westlondonrubbishdiet. The U.S. state of California has passed a bill banning the use of disposable plastic bags in grocery stores, pharmacies, off-licences and other businesses throughout the state. The bill, which needs to be signed by the governor before becoming law, would usher in the first statewide ban of this type in the United States, starting July 1, 2015. A number of U.S. cities have already banned disposable plastic bags in shops, including San Francisco, Los Angeles, Seattle and Portland, Oregon. The law would allow the sale of reusable plastic bags at grocery stores. We’ve sent our latest newsletter to the printers and it will be dropping into your letter boxes shortly as well as being available at libraries and other key locations. Or, click on it to download. Britain’s shameful waste of food has been confirmed by a new study that shows more than two-thirds of produce grown for bagged salads, just under half of bakery goods and four out of 10 of apples are thrown away. Tesco, working in conjunction with the Waste and Resources Action Programme (WRAP), calculated the food waste “footprint” for 25 of the supermarket’s best-selling products – looking at what was wasted both inside its supermarkets and in the homes of its customers. The retail giant admitted that 28,500 tonnes of food waste were generated in its stores and distribution centres in the first six months of this year. It also estimated that uneaten food costs families about £700 a year.